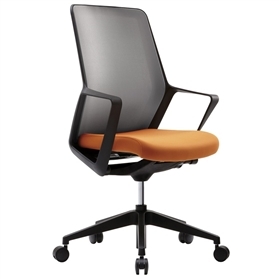 A Task chair family with a wonderful clarity of design and simplicity of line. Clean lines and simple aesthetics mean that the Flow chair fits comfortably in most environments. Flow has a consistent design style; from the elegance of the new back frame to the specially designed and developed synchronised tilt mechanism, combining the back, armrest and seat in one continuous sweeping entity. A breathable, elastic mesh provides superb support over a large contact area for long term user comfort.